What will Your Venture Be? It’s hard to believe that we’re halfway through July already. Destin beach vacations are well underway but if you ever wonder what there is to do in Destin beyond the beach, consider a venture you will never forget with family, friends or colleagues. The SunVenture catamaran is a unique experience the moment you arrive on the boat. You’ll jump into a sea of Guy Harvey artwork, indicative of the experience that awaits you. Along with the colorful, sea-themed artwork, you’ll be greeted by Captain Rick and Captain Rod, who will not only make your Destin Florida cruise fun and memorable but educational. 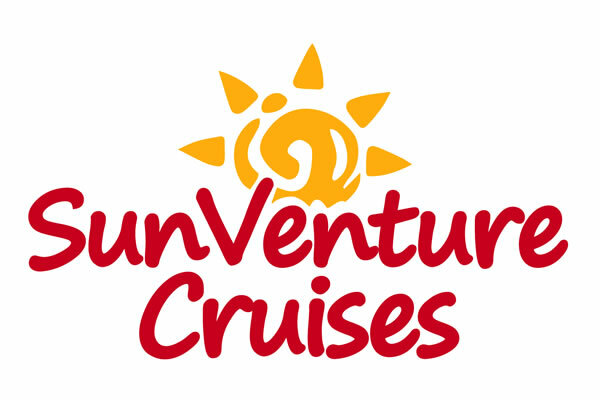 Every SunVenture experience is different, adventurous and distinctive. From up close and personal interactions with dolphins to exploring historical shipwrecks, the SunVenture’s narrated tours give you the opportunity to enjoy a relaxing and fun time on the water. You never know what you will encounter as you cruise the emerald green waters – even rare spider crabs. The community’s response to our new ‘venture’ has been tremendous as well as the memories, experiences and friends we’ve made along the way. Our customers sure do appreciate a new cruise option for the South Walton/ 30 a / Sandestin area so they don’t have to fight the traffic into Destin to catch a dolphin/sunset or Crab Island cruise. Crab Island is in peak season right now and definitely a top rated thing to do in Destin. There’s not many places where you can jump in waist deep emerald green waters to play basketball, listen to music, jump on trampolines, swim up to a restaurant, mingle and play – all with the stunning Destin bridge and Destin Harbor as a backdrop. Sounds like a dream, we know, but it’s real and you have to experience it for yourself before the summer ends. Our Destin private cruise schedule is extremely flexible. We recently hosted an amazing group of ladies from the Mississippi Builders Association for a fun Saturday brunch cruise. We’re up for anything….just ask. We even offer an amazing dinner & dancing cruise aboard our sister yacht, the SOLARIS, for a Destin dining experience you won’t forget (even Destin fireworks cruises available). So whatever type of Destin cruise you’re seeking – we can make it happen. Contact us today!